Holiday shopping can be difficult for kids sometimes because maybe you’re gifting your niece or a friend’s daughter or whoever and you just don’t know anything about this age. 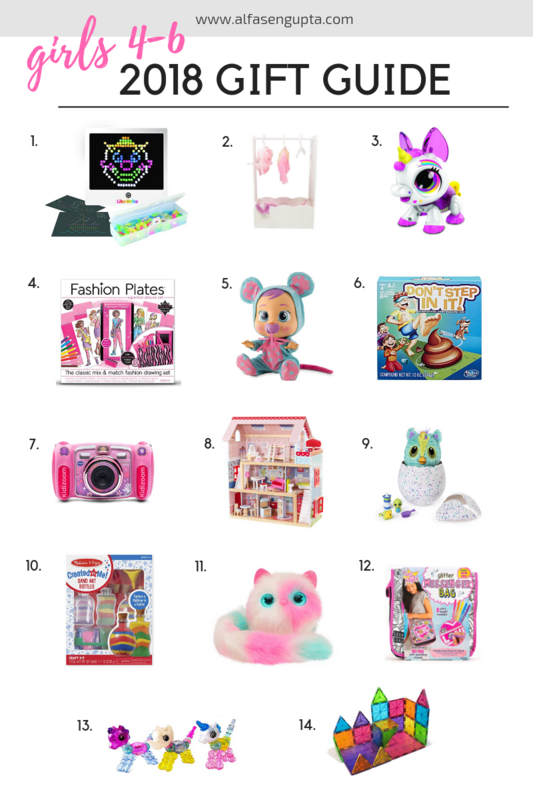 Because I’m living in this little age with Aria, I figured I’d put together a gift guide of all the things my daughter either has and loves playing with, or they are potentially on her “Santa wish list”. That list keeps getting longer by the day, especially as the holiday toy catalogs arrive in the mail. Either way, I wanted to share with you guys some ideas if you’re stuck! Plus I should add that though this was geared for ages 4-6 girls, my son loves a lot of these toys too! I had this as a kid and was obsessed with it for hours! Such a fun little retro game that I’m super excited to gift Aria (and Rishi) this year because I think this will be a definite winner around my house! We currently keep all of her dresses in drawers which of course is just a giant mess! I’m contemplating a little dress up rack so she can see everything instead of pulling it all out of the drawers. Plus I love that it has a little storage area at the bottom so it can hold a few more things like shoes and accessories! I love toys like this because not only are they fun but are also about STEM. She’s learning and playing at the same time, and given me and my husband are both engineers, toys like this are ones we love! This is a hot ticket item this year. My mother in law gifted it to her for birthday and it totally sounds like a real baby! Not sure if your kids are still into dolls but Aria still very much loves them so she’s been pretty attached to this thing! It actually cries real tears and it’s pretty cute! Don’t worry, you can turn it off so it doesn’t randomly cry in the middle of the night which was my concern! This game is so much fun! My kids are getting more into playing board games, and while this isn’t your typical “board” game, it’s absolutely hilarious! You basically make little poops out of playdoh and the goal is to not step in it! We played this as a family along with my sister and my mom and it basically had everyone laughing! I highly recommend it! My kids watch me take pictures so last year Aria had said she wanted a camera for Christmas, and we got her this one. It’s super easy to use and definitely break proof as it has been dropped many times! I looooved this dollhouse when I was putting this gift guide together. Aria has a hand me down one from a family friend, but I love that this one comes with all the furniture! So I know if I was in the market for one, this is definitely the one I would be leaning towards! Both Aria and my son play with it ALL THE TIME. It’s gotta be one of the top toys in my house that’s played with. Hatchimals are all the craze and I think I’m new to this! Aria got some for her birthday and she’s been playing with them nonstop! I saw these hatchibabies and thought they would make an adorable gift if you know a little girl out there who is also obsessed with the hatchimal craze! At a recent birthday party and the pumpkin patch, my kids got to do some sand art and they absolutely loved it! I think it’s a great way to to create something and keep those hands busy! If you’re looking for an interactive toy that is also plush, this one seems to be really popular on a lot of holiday lists! Aria has definitely circled this one in her toy catalogs. We’ll see if it actually makes it under the tree! Stuff like this is right up the alley for my daughter. She loves to color and create, and to be able to make a little bag that she designed is her jam. Plus I love that it takes time to create something she can use. Aria absolutely loves to make bracelets and this doubles up as a little animal too that they can play with. This is one of my things on the list to potentially get her! We love love love Magnatiles! I know they can be on the pricey side but definitely worth it. They are amazing toys, but really help with using your imagination to create things. Because we already have a set, I’m contemplating some magnatiles car accessories for my kids that way the creativity can go on! Other top gift options always include experiences!! Perhaps a tickets to a zoo or a museum! Or even just movie tickets! It doesn’t have to be big as long as it’s an experience! Those have got to be my favorite type of gift no matter the age! Last but not least, I also love subscription presents like Highlights! It’s like a gifting for a whole year (or however long the subscription is!)!! Anyway, I hope you guys liked this little guide to help your holiday shopping off to a good start! Thank you so much for being here! If you happen to love this gift guide, please consider shopping and checking out in an actual web browser instead of an app/Instagram. These are all affiliate links, and I receive a tiny commission (to help run this blog and all I continue to do for you!) on anything you might buy via my links and unfortunately, I don’t get any credit for any sales made in any apps which include the amazon app on mobile. If a link from Love, Alfa is the last link you click on before checking out, I’ll receive credit even if it’s something that isn’t on my list. I appreciate all the support you guys give me! You’re the reason I’m here! So, THANK YOU! !